Patience Persisted for Me Today!!!! Well, I found myself back at Target again today........I know, I know I was just there two days ago....But, I am so glad I had to go back!! All the Christmas Clearance was 75% OFF!!! I racked up......I got Stocking holders for $3.74 (two pack), Christmas ornaments for $1.74-2.24 a pack, stocking for $2.49 and $3.24, and some baking kits for 74 cents!! They had NO wrapping paper, tissue paper, candles for the windows, outside Holiday yard items, except for a few wreaths and lights. Patience persisted for me this time.....YEAH!!! I also had a chance to go to Kohl's....they had a few Clearance deals on clothing.....there Christmas items were on Clearance for 70% off....but it was slim pickings, and what they had was still a little to highly priced for me anyway....But then again I am Cheap...LOL...LOL!!! Had to make a return at both stores and at both places there was not another person waiting to return an items...SO if you have returning to do......get to it!!! Now is the time!!! I made my travels today in hopes of finding some GREAT Christmas Clearance....I went to Target, they have all their Christmas related items 50% off....They had LOTS of ornaments (boxed and individual), lights, wrapping paper, gift bags, food items, wreaths, and much, much more!!! I myself did not buy anything...still not cheap enough for me..LOL...LOL!! I will wait for the 75% off.....They did have some items that are packaged in Christmas boxes, or wrap that are also on clearance that can definitely be used year-round!! (plastic cups, white tissue paper, few plates, candles, body wash/lotions etc.) I also had a chance to get to Walmart...they also have all Christmas items for 50% off as well. They have LOTS still left!! Lots of gift tags, wrapping paper, lights, candy, make-up gift sets, Christmas balls, and stockings, and MORE!! I bought only a bag of candy...Will wait to see what is still left at 75% off in a couple of days!! At Christmas Tree Shops all Christmas is 50% off as well.....They had LOT of wreaths, wrapping paper, candles, tins, gift bags, did not see any lights or gift tags. I also did not see ONE Christmas Tree at any of the 3 stores...and only The Christmas Tree Shops had candles for the windows....So I guess they are the HOT items everyone wants...LOL!!! If you go good luck!!! Well, let me just say...my house is OVERLOADED!!! I mean since Christmas I have been Freecyling like Crazy!!! Trying to move out some things so I can walk round...LOL..LOL!! Well not that bad...YET anyway! Just trying to make it simple to clean every week...I hate to have to pick up a TON of stuff to dust or mop!!! If you have never Freecycled it is GREAT!!! Most people would love to have what you refer to as "junk".... it's awesome....plus most people are so VERY appreciative!!! It makes you feel so good to clean out your house and give someone something they may need too!! It really is a great feeling!! I have also received a lot of great things from the site as well!! It works both ways!! You never know what someone may be giving away!!! Like they say someones trash maybe another person's treasure!!! Since I have been freecyling...now I think twice about throwing things in the trash...LOL!! Check it out....You never know what you may get!!! Have you alreday been frecycling???? What is your best find??? Still Have That Sweater From Last Christmas???? Well, if so.......now is a great time to see if someone else may love that sweater Aunt Susy bought for you last Christmas. EBay is having 10 cent listing day TODAY ONLY!!! So what do you have to lose...list it and see if someone actually likes that gift you hate!!! LOL LOL!!! Even if you only get $10 for it....it's better than in your closet making not a cent at all!! Or you can use the money to do a little shopping for yourself....my sister said Target is having a a GREAT clearance sale on toys, Christmas items, and clothing.....in January they usually clearance bedding items, and baby products...so keep a look out!! In January restaurants usually want you to spend those gift cards you received for Christmas so they have meal deals/ and specials...last year TGIF's and Applebee's had some great meal deals...hopefully they will do the same this year!! Right now..... The Children's Place is having their Monster Sale, Old Navy is having a 50% off Sale, and Amazon their Year End Sale. This is the best time to stock up on winter jammies for the family, winter coats for next season, winter gloves/hats, and clothes for the rest of this year and next!!! I just love to look at the price tag and pay about less than 1/2 that when it rings up on clearance at the register...It's like a rush...LOL...LOL!!!!! Well I have had Parties all weekend long and have been a little busy...we are almost there!!! Although the kiddies have already gotten some presents to open yesterday and today... they were so EXCITED there is so MANY MORE to come!! And my son has even been so excited to give out present we bought for our friends and family as well. He makes sure to tell them its from him, and they he helped picked it out...LOL!!! Hey, he did have to make that trip to the MANY stores we had to go too....so he does deserve the credit!!! Well, tomorrow we are off to my sisters place for some good food, family, and fun times. Hope you have a Wonderful Christmas and enjoy the time with your family!!! Old Navy One Day Sale Tommorrow!!! Thanks Laur for the Heads UP!!! Well we are down to the wire!!! Only a couple days away...and I have so much still left to do...AHHH!!!! I did most of my grocery shopping today...That was MADNESS....if you have to go..I advise get up at the crack of dawn and go...or go VERY, VERY Late!!!! I will send hubby(LOL!!) to go on Christmas Eve for a few last minute...need to be fresh items!! The grocery store will not be seeing me for a week!! I am steering clear. I'll let him have some fun there...He He He!! I'm all wrapped, and all shopped out, now I just have to visit, hand out presents, and enjoy family and friends company the next few days. Should be great!! I will try to post again real soon....but as you and I both have ALOT to do the next couple of days I would like to wish you all a Very Merry Christmas!!! Have a great time bonding with the fam!! OH!! And enjoy a drink too!! You deserve it!! LOL!! If you still need some Christmas presents..Overstock is going to help you get it done without leaving the house...Order from these items and it is Guaranteed to get there by Dec. 24...and best of all it's FREE!!! Good Customer Service...It's Still Around!!! So I called up V-Tech (the company that makes it) and told them what was happening...and they said send it back and we will sent out a new system. I did have to pay $11 to send it back insured, but today we received a new one in the mail (took about 10 days only!) ...the whole system, a controller, game console, and game!! I am very impressed with the customer service!! My sister said she was going to purchase one for my niece (she loves playing the Dora game at our house on it!) but said with all the problems i was having with ours, she was having second thoughts.....But wait until I tell her how great the customer service was!! Anymore customer service stinks most everywhere.....but I guess good customer service is still out there!!! New York & Company started a great 50% off everything sale. Through today, 12/19, you can also use code 2014 for an additional 30% off!! So I ran into CVS last night to pick-up some diapers that were on sale....and I walked in and headed down the side isle towards the back of the store to get the diapers...and when I headed down the isle a man stopped dead in his tracks...mumbled something and turned around the other way...I thought strange guy.......so I got my two packs of diapers and headed back down the same isle toward the front of the store and the same guy is looking nervously all around and putting all these Oil of Olay boxes in his basket.....I know stocking up is my thing...BUT the Oil of Olay was not even on sale??? So I was thinking to myself why so many boxes for a man to get??? Must like a moisturized women, I was thinking??!! LOL LOL So I get in the checkout line....and there it is.....the strange man with that basket full of Oil of Olay and other Mics. items I am sure headed right out the door...CVS basket and all!!!! The buzzer at the door beeped...and he just ran OUT!!! I was SHOCKED!!! He was probably about 25 years old....I mean seriously he knows much better than that!!! The Manager ran out after him but he was gone...he said they have surveillance cameras all over the store, and hopefully they will get him. It was scary....never before have I seen anything like it!! Well, I hope he gets caught somehow!! Well that's it...besides the food for Christmas Dinner...I am officially done shopping for this Christmas!! Feels GREAT!! And I can also tell you that my kiddies are MORE EXCITED than me about that!! No more trips to the stores...like everyday!! I found an outfit for Christmas Eve and Day today....YEAH!! ***Macy's Rocks*** My son woke me up today saying he wanted to see his Pop-Pop today...that he missed him...AWW!! So he called up his Pop-Pop and asked him to come over...and so Pop-Pop and Rosie came over today fora visit!! My son was so excited!! My dad just cannot wait for the grand kids to open up all their Christmas presents...I think he may be more excited than the grand kids..LOL!! The Big day is almost here...as we are down to 7 sleeps!!! Kohl's is having a 2-Day Christmas Countdown Sale today and Wednesday....use Code WRAPITUP30 - Expires: 12/24/2007 to save an additional 30% off!! And they are offering 99 cents per item shipping too!! Be sure to check out there Clearance its 60%-80% off!! 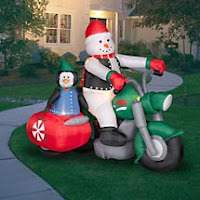 Walmart has this Snowman Riding Inflatable for ONLY $24!! Regularly $40!! Use Site to Store and shipping is FREE!! Well today I got to go and FINALLY get my hair done at the hair salon......WOW!! I have to say a big difference.....all the roots are gone...YEAH!!! Could not be more excited!! Tomorrow I have to do a bit more shopping....me and sis are heading out to Macy's to try and find ourselves outfits for Christmas Day and Eve...should be fun with all the kiddies in tow...LOL!! They are having their last ONE DAY sale before Christmas...tomorrow is preview day. Hopefully we can find something or else we will be wearing our P.J's to dinner...LOL!! Well my shopping is all done, and now I am starting to get so excited about the Big Day!! I know my son is going to be so excited!!! I just can't wait to see his face when he opens up all the gifts from Santa!! The best part of the holiday....In my opinion. Well off to bond with hubby for a bit...Good Night!! Well today was wrapping day in our house......FUN! FUN! FUN!! The best part is when you go up in the attic and pull down all the bag of stuff you bought and find a few items you bought sooo long ago (or at least it seem) that you forgot about!!! Hubby. my son, and even my daughter and I all wrapped and label every one's gift today/tonight. It took us about 2 hours or so....My daughter had the best time trying to eat all the wrapping paper...and trying to get the pens too!! My son was an awesome help!! He was writing labels, handing over pieces of tape, getting presents to wrap....all while having so much fun!! He loves it when he can help do grown up stuff, as he calls it!! He always says "Mommy, needed a Nice boys help today...." We also had his soccer pizza party today too. That was fun...a chance for him to see hos soccer pals again!! I was Amazed...he ate two pieces of pizza, and 3/4 of a cookie!! I was impressed!! Well I am tired and off to hit the sack.....Talk to you soon!! P.S. -A pic of our lovely Christmas Tree is above!! If you still have some shopping left to do...head to Amazon....only 2 Days left for FREE Super Saver Shipping w/any $25 purchase!!! They have some GREAT toy finds!!!!! Shelcore Sound Beginnings Groove 'N Go Music ONLY$5.00 (Was $19.99). Today was just a stay at home day. I was hoping I would get a lot of Christmas wrapping done today but that just wasn't the case. Oh well maybe tomorrow. I can't believe that Christmas is only 9 days away. The countdown has begun. I just can't wait to see my kids faces along with my niece and nephew on Christmas day. They are going to be so excited!! We'll my son has picked up on me being on the computer and is grabbing the keyboard along with the modem so my time is coming to an end. We'll goodnight to all I am going to try and watch some of Pirates of the Caribbean with my hubby before it ends. Goodnight to all. Today was nice relaxing day.....We hung out at home until about 2 pm, and then headed out to Old Navy.....Had to get my son his Christmas Eve and Christmas Day Dress shirts.....last minute, I know....BUT I was waiting for a GREAT DEAL and found it at Old Navy today!!! They were having some great sales today!! Hubby got a few shirts, 50% off, as did my son, and even me and my daughter as well!! Everyone actually got something...Rarely happens!! Then we headed to Bertucci's for dinner!!! YUMMY!!! It was delicious!! By the way they are having a Geat Gift card Deal too!! If you buy a $50 Gift card you (As the giver) receive a $10 bonus gift card for yourself to use on your next visit!! That make for a good deal!! We then headed to my sisters for Cake for my Brother-in-law. Some good old family time today!! It was a GREAT Day, but I am a little tired and need to head to bed!! **Genaurdi's has Spiral Sliced Hams this week for ONLY $1.29 a pound! I just love Saturday's maybe it's because my hubby is home, but its just seems to always be such a relaxing day. Right now my son is sleeping so I decided to write. He has radar for when I am on the computer and so it is near impossible to write when he is awake. My Husband and daughter are out shopping together. How Cute! I have know idea for what, but they have been gone since noon. We'll tonight I am having cake for my husband, because it is his Birthday on Monday. I still have to run and pick up the ice cream cake. I know nothing like waiting till last minute. But I just can't bear to wake up my son. I figure I'll go when he wakes up from his nap. It figures they always take long naps when you don't want them to. And when you want them to take a long nap they sleep for 20 minutes. We'll I am going to go eat some lunch I'll tell you how the whole cake thing went. My husband doesn't like a big fuss over his birthday so he doesn't even know I am doing this. Nothing like a surprise!! It makes it all the more fun. Talk to you later. I Got the Best Gift Today!!! Today was a GREAT DAY@!! I actually got hubby's Christmas Present today and for the first time in a while I think I got an awesome Gift!!! I hope he like it!! After all he deserves it!! He's the best!! Usually I just get him TONS of clothes...but this year he actually need something and he will never guess what I got him!!! Sorry, I cannot tell....even though he never reads this....if I were to say what I got him he would actually read this for the first time...just my luck...LOL...LOL I was supposed to get my hair done today....but my hairdresser is sick...was supposed to go on Tuesday night but she was OVER-booked, so we will shoot for Monday night....hopefully as I have roots the size of Florida right now!.....LOL!! I got a great deal on a New Bedding set on Overstock and it just arrived last night...so tomorrow hubby is going to repaint our bedroom to match the new set!! SO excited!! Well about to watch "The Grinch" with the Family...so have to end now! Will write again soon! If you need to buy any gift card for presents...some restaurants are giving an extra Bonus gift card to the giver of the gift with a Gift card purchase....check it out! * Friendlys- Free $5 Bonus Gift card with ANY Gift card purchase of $25 or more. *Macaroni Grill- Free $5 Bonus Gift Card with ANY Gift card of $25 or more. *Fridays- Free $5 Bonus Gift card with any Gift card purchase of $25 or a FREE $10 Bonus gift card with any Gift card purchase of $50 or more! Today they had Mommy and Me at one of your local malls...It was so much fun!!! They read Christmas stories, played with lots of toys, sand songs and danced, and then had a little drink and snack....all the kiddies had a great time!! They were all wore out by the time we got home....they all took great naps!! Then some packages arrived...and the best part of the packages was the boxes and paper filling inside...the four kids had just the BEST time playing in them, hiding in them, and playing peek-a-boo with the younger ones. I can still remember pulling my sister in a diaper box Oh so many years ago!! Boxes are a blast when you are a kid!!! It's so amazing how your imagination works when you are so young!! Then we took the kiddies took look at some famous Christmas Lights spots around town...they loved that too!! It was a great day for the kiddies..a whole lot of FUN!!!! At Amazon they have this 8 Pieice Pyrex Storage Set for ONLY $9.99 (regularly $29.99). It also qualifies for FREE Super Saver Shipping if you spend $25 or more. Hurry only 5 days Leftto use Super Saver Shipping and recieve by Christmas Eve!! Today was a nice warm day...a little soggy out from all the rain we have been having...but it was a great day to hang out outside for a little while....We walked down the block and checked out all the Construction vehicles and workers...(just to make sure they are doing a great job...LOL) They even honked the big dump truck horn for us....My son was so EXCITED!! We also made Chocolate Chip cookies tonight....a family affair...even my daughter helped...she had a few bites of one...and LOVED IT!! My son loves to help me cook....even though I am the worst at it...as for the cookies....hubby said you need a gallon of milk to wash them down they are so dry....He said at least they are edible this year.....LOL..LOL!! He is always trying to be funny....For some reason I just cannot make good cookies...not even the ones that are pre-made...you just bake them!! Oh! Well...who cares if they taste good...all that really matters is we all had fun making them!!!! We also all watched "The Polar Express" on TV tonight...my son has the book and he loves listening to the story...he LOVED the movie even better!!! It was a great movie!! The above also qualify for FREE Super Saver Shipping if you spend $25 or more!! Also starting tomorrow Toys R US is starting their Twelve days of Christmas Deals again for this year!! Last year they had some great deals!! We'll today I stayed home all day but I got a lot of Christmas shopping done online. Their were great deals. I bought stuff at Victoria's Secret, and I was able to use 3 coupon codes. Then I ordered stuff at Bath and Body Works and I was able to use 2 coupon codes saving like $18.00 I saved $8.00 dollars on shipping and then another $10.00 because I spent $30.00 dollars. Needless to say I was so excited, I love getting deals online. I still have a few more gift cards to get though, and hopefully by this weekend I will be done all my Christmas shopping. And then I have to wrap it all. Fun stuff. Although my Dad and Rosie said they would watch Haley for me one day next week so that will really be helpful. We'll I am shopped out and I better head to bed before one of my kids wakes up. I'll talk to you soon and have a great night. Fisher-Price Dora Sparkle & Twirl Mermaid Doll at Amazon for ONLY $9.99 (reularly $39.99) ...Qualifies for FREE Super Saver Shipping with a $25 purchase or more!! If you need anything at Target use coupon code TGAFLETJ - Expires: 12/30/2007 to save an additional 10% off!! Have you tried Dunkin Donuts coffee at your home?? If not here is a free sample of it!! Enjoy! Well today was a good day....we went to playgroup today...and the kiddies had a great time!!! Especially with the Parachute!! They just love it so much!!! And for all you who have not yet tried it the kiddies have just as much fun playing on/under it as it shows on TV..Really!! We also got the mailman his gift card today..for all his hard work throughout the year....my son picked out a nice Holidays card to put it in and we walked it down the block to him....My son was so so excited to give it to him..and even told the mailman that he had picked it out!! My so n loves the mailman.......WHY?? He is the one that brings the packages to our house...that sometimes have NEW trains/DVDs/toys for him inside!!! So he just loves the mailman!! LOL! LOL! I can see that my son is also starting to understand how much people appreciate when you do nice things for them!! That's so awesome!! 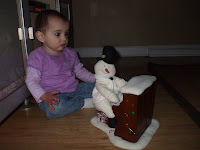 We also jammed to some Christmas music today....me and my daughter that is....my son is starting to get a little too cool for that now... She was having a blast...especially with the singing snowman!!! I will attach a pic for you to see!!! Do you ever wonder why Construction vehicles are so COOL? Well my son could probably write a mini-book about just how cool they are...They are doing major road construction down my street, so the dump trucks, backhoes, diggers, and more are visiting the neighborhood for a few weeks....Today on our way home they were digging in one section of the road so we had to sit and watch them for about 15 minutes or so....My son could of not been more excited!!! He loves it when they pick-up up the cement, and dirt and put it in the BIG dump truck...he especially loves the loud bang it makes hitting the inside of the dump truck.....He gets so excited watching and telling me all about what the workers are doing....his little voice changes tone as he talks......its so darn cute!!! After a little while they opened the road back up and we were able to pull into our driveway....he was still watching them as we walked inside....Talking about Crashing the cement....busting up the road....all while his sister lay sound asleep.....maybe someday she too will be so excited about the construction men and vehicles...I cannot wait!! We came inside and guess what we played......Construction Site with all the construction pieces we have.....We had a great time...now I see why the construction makes him so happy....it so very exciting...and what is not to love about destruction of the road you drive on everyday anyway??!! Toys R Us is having some great cyber Monday toy deals..TODAY only!!! They have this V-Smile TV Learning System - Pink for JUST $24.99 (half price) and if you spend $49 or more it ships for FREE!! Otherwise shipping is about $8. My son has this and LOVES it...it is a great teaching tool and fun too!! 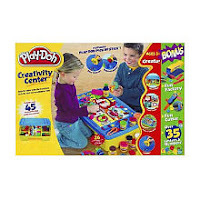 They also have this Hasbro - Play-Doh Creativity Center Value Pack for half price at $14.98. Save $10 off a $30 purchase if you use Bill Me Later option too. They hav e MUCH for too!!! Check out all their Monday Deals for that perfect gift!! Well it was a lovely day yesterday...so we got a chance to hang outside for a little while yesterday...My son was practicing his skateboard moves.....it actually takes him the same amount of time to put all his pads and helmet on as he spends skateboarding....LOL...LOL But he still has a blast even if it is only for a few minutes....We played golf, took a walk/ride around a few blocks, and just plain old hung out and had fun....my daughter just loves to be outside watching her big brother. She is always cracking up at him on his bike!! 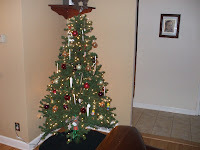 Today we had to finish up some last minute shopping....almost done....so close...the kiddies just cannot WAIT!!! The lines were not bad at all...except for AC Moore, of course!! BTW if you have a HUGE Thomas Fan in your home....AC Moore has All Thomas & Friends on sale this week (until Thursday) for 40% off...they had a bunch of different trains, tracks, sets, wooden, plastic, buildings, etc. If you plan on using Free Super saver shipping at Amazon...you ONLY have 9 days left..SO Hurry!! The stores are getting desperate as time is running out....so keep your eye out for Mega deals in the next few days/week!!! If you are in need of diapers this week, Shop Rite has Pampers for $7.99, and CVS has Huggies jumbos 2 for $16.99. Fisher-Price Action Sounds Trike and it is on sale for ONLY $14.99 plus shipping (regularly $49.99). My son got this for his 3rd birthday last year and every time we go outside he rides it! !This is a GREAT toy!!! Hope your shopping is coming along as good as mine...I LOVE Amazon!!! We'll today is really nice outside I think it is like 50 degrees. My Dad and Kevin are working on my kitchen. So at least they get to enjoy a nice day outside. Hopefully next weekend we will be painting. It has come along way, and it looks great. I can't believe it is my kitchen. We'll probably just going to hang out at home today. A nice relaxing day. Talk to you soon. Amazon is having a GREAT toys sale....and alot of items ship for FREE with Super Saver shipping...only 10 days left though....So hurry...Some great deals I found.......Hasbro Playskool Kid Motion Bounce 'N Go Inch-Along for $12.99 (regularly $ 34.99) Plus it is eligible fro FREE Super Saver shippi ng!! They also have the Hasbro Playskool Dream Town Rose Petal Cottage for ONLY $47.99 (regularly $79.99)..also eligible for FREE Super Saver Shipping! For ONLY $7.99 you can get this Leapfrog Alphabet Pal Caterpillar, it has a regular price of $19.99 and also is eligible for FREE Super Saver shipping w/a $25 purchase. Take a look if you need some toys for Holidays Gifts!! Today the kiddies and I made a trip to Macy's to try and find my son hos Christmas outfit and one for me as well....I did great for me...my son not so well!! Came home empty handed for him....all they really sell is cords with a sweater and tie....Sorry, just not my thing.....He is now in the boys department..and I cannot believe how much smaller it is than the toddlers sections in the stores....or maybe it just seems that way because I do not like him in sweaters, or sweatsuits with footballs and characters all over them.....Maybe it is me???? So I guess I will just have to keep searching...I'll find something I am sure....just may have to pay full price....Ha! Ha! Thant's too funny!!! LOL LOL!! Also made a trip to TJ Maxx tonight....Got a few Christmas presents, and hubby got some work pants, and we purchased a few "Santa" presents for my son. They have an AWESOME amount of toys their like Little Tikes, Thomas, V-Tech, Cinderella, Bratz, Books, Puzzles, and much, much more!! And the prices are great too!!! If you have one near you...you should check it out!! The kiddies are all shopped out...so tomorrow we will have a home day, rent some movies, have a snuggles fest, and maybe make some cookies........Good Night for Now! Little Tikes 12-Inch Bike with Basket $46.66 & this item ships for FREE with Super Saver Shipping. (regularly $99.99). 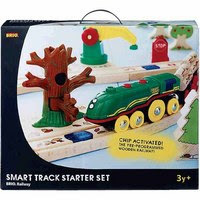 Toys R US is having another Friday Night/Saturday Morning sale this weekend....They have this BRIO Smart Track Starter Set for 50% off at 29.99. Any little boy would love this for Christmas!! Well my snowman made out of cotton balls did not go over too well with my boy last night .....We got dressed in our snow gear and headed outside for a little winter snow FUN!!! And Man did he have a blast!! We were out there for about an hour and I had to beg him to come back inside....We attempted to make snowballs....not nearly enough snow......then we tried shoveling.....no snow on the pavement, just on the grass and cars, and mulch areas.....then we tried making a snowman...did not work out either...so my son decided we should get all the snow off of our front yard grass with shovels......Well he had a blast doing it....No, we did not get all the snow off...we made tracks and cleared away some of it....He was so proud of our job well done (our hard work as he calls it). He asked to go back outside this morning as soon as he woke up....but most of snow already started to melt away....hopefully there will be another snowfall real soon with LOT of snow...this way we can make a BIG snowman, and throw snowballs, and even maybe ride on the sleds!!! 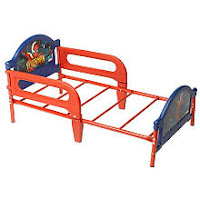 ToysRUS today has this Spider-Man Toddler Bed for $28.98 (regularly $54.99) online Only..plus it is eligible for $10 off $30 purchase if you use bill me later option. They also have You & Me 4-in-1 Doll Stroller: Pink with Butterfly Print for Only $4.99 (regularly $16.99) today only . At Overstock right now they have this Terese 4-piece Comforter Set on Clearance for ONLY $34.99 (regularly $150.00). 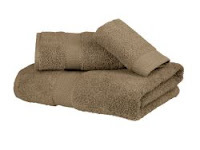 They have LOTS more bedding clearance as well.....Take a look!! Free Site Shipping too!! We'll today I took the kids to get their Christmas picture done, it did not go that well though. My daughter hated the dress, wouldn't let me put her necklace on and cried because she didn't like to get her picture taken. So when we arrived at JCPenney, the lady was able to get two pictures of her but she was crying, which scared Nick so he began crying. Needless to say I walked out of there with no pictures of my daughter in her adorable Christmas dress, although I got a great picture of my son. At least one of them cooperated. I can't blame my daughter though I hate pantyhose too. I mean they are uncomfortable. So tomorrow I will be taking pictures of the kids in front of my Christmas tree and sending them into Snapfish to get developed. Oh we'll it makes life exciting. I had to laugh though because their was another mother getting her kids picture taken in the room next to us, and she was changing their outfits so they were wearing different clothes in each picture. I mean I can't even get one picture with my kids wearing one outfit. We'll both of the kids are sleeping, so I am going to call my hubby, and rub it in that I know what he wants for Christmas. I can't write what I think it is because I don't want to risk him reading this. I know he doesn't believe me that I know what it is but he sure will be surprised on Christmas Day. Goodnight to all! Well I would of thought that with all the talk about how the stores are hurting so badly this holiday season that the deals would be amazing!! Well not so much, at least what I need to buy.....I am holding out on a few last minute gifts I need to buy in hopes that I can really score a deal or two....or maybe I am the sucker who will be paying full price the day before Christmas Eve...(I do not shop on Christmas Eve....a little too crazy for me!!). JCPenny is having some Wednesday Deals today....They have these Entice Towels From $1.99 To $4.99....they have much more too!! 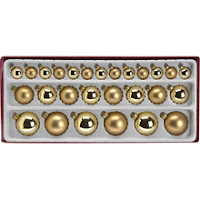 If you still need Christmas balls for your tree LNT has this Set of 27 Glass Ornaments Gold for $9.99 (half price). I am still trying to find the prefect gift for my daughter...but as I sit here typing away....I may of found it....a printer filled to the brim with paper!!! I just cannot keep her away from it!!! It is just so fascinating to her....all the toys are all lined up around her and she prefers the paper......she also loves kitchen spoons and spatulas too...they keep her so busy when I cook and clean-up....LOL....LOL Well I had to run a ton of errands today...my poor kids had to tag along too. They were good as gold though.....as long as we have snacks, bottles, a Binky, and juice we are good to go!! Plus I always try to include my son in the errands too...He gets so excited to carry in the packages to the post office, and hold the receipts as we leave the store...It makes errands a little bit more fun at least...I know he cannot wait for Christmas...BUT I know he also cannot wait until all the shopping is over as well!! Kohl's is running their Biggest Sale of the Season right now....today and tomorrow only....PLUS for every $50 you spend...you get $10 back. 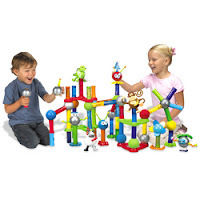 At Etoys they have a bunch of toys with FREE shipping like this Magtastik Preschool Magnetic Building System on sale for $19.99 (Regularly $34.99). At Amazon they have this Peg Perego Aria Light Weight One Hand Fold Stroller in Mint for $140.00 (regularly $219.99) Plus it ships for FREE!! My kitchen is almost at the finish line! I am so excited because today my Dad came over and patched my kitchen. He is hoping that it will be ready for paint on Sunday. I am hoping so too, since I really want to have something at my house for the holidays, but I am waiting to see if the kitchen gets completed. I can't wait to be done with it. I hate when my house ids disorganized, and it has been ever since we started the kitchen weeks ago. I just hope when I move, I get a house with a new kitchen, you know? We'll tomorrow I take my son to the doctors for his 1 year check-up, hopefully he doesn't get to many shots. And my dad is supposed to come over tomorrow to do some more patching. I am going to put my daughter down and then I am off to watch the Hills, I know its a dumb show, but I still love it. Goodnight to all. Amazon is having a toys sale up to 60% off certain brands....they have this Hasbro Playskool Let's Play Together Peek 'N Play Discovery Dome for $29.99 (save $20)..Plus it is eligible for FREE Super Saver Shipping. My nephew has this and my daughter and him absolutely LOVE IT!!! Keeps them very busy!! They also have this My Little Pony Ice Cream Dream Supreme With Rainbow Swirl for $11.99 (Save $8.00) it is also eligible for FREE Super Saver Shipping on orders over $25. The weather is little nasty and cold out...so we stayed home most of the day today......with the exception of running to get some milk...man sure wish we had a milkman on days like today...LOL....Did a little more shopping online today...trying to finish up ASAP...as we ran to a few stores yesterday and they were already PACKED to the gills with customers!!! Can't imagine what it will be like in two weeks!! At Shop Rite they have Beechnut baby food 12 jars (stage 2) for just $4.49....They also have Beechnut Baby cereal for $1.39 a box.....be sure to use your manufacturer coupons to save even more!!! And remember that for every $75 in baby related products you buy at Shop Rite you get a $10 baby bucks certificate!! CVS this week has Pampers jumbo packs on sale for $8.99...plus if you spend $20 or more on select P&G products (Tide, Pampers, Charmin Toilet Paper 4 packs, Bounty, Duracell, Cover Girl) you get $5 back in Extra Bucks!!! Don't forget to use your manufacturer coupons as well!!! At Amazon this Baby Gymnastics Bounce and Spin Zebra by Fisher Price is on sale for $35.88 (save $9.11) and it qualifies for FREE with Super Saver Shipping. Shop Macy's and use code MACYSFRIEND to receive 20% off + Free shipping. This promo ends tomorrow 12-3-07. 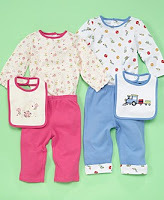 They are currently having The Perfect Gift sale.....They have these great First Impressions Baby Boy & Girl 3-Piece Bib, Bodysuit and Pant Set (Org.$9.98) NOW! $4.99. Their First Impressions brand is awesome, they wash great, no fading or pills!! Today was a Family Day....We had a birthdays party to go to today...one of my sons little friends.....They had a great time....playing with all the toys new to them at her house.....it is amazing all the fun they have with new toys and new children to play with....He was funny...they had a pinata there and when all the strings were pulled and NO candy came out...my son placed his basket under the hole they made so the candy would all fall out......It made me realize just how old he is getting.....He was nice enough to share some of the candy with everyone though...not to worry!! We also rented Ratatouille tonight and had movie night...It was a funny movie.....my son LOVES movie night with the fam....he gets sooo excited!!! !